← Hero’s blog is live! Thought I would show off my successful turkey pies from Christmas day. 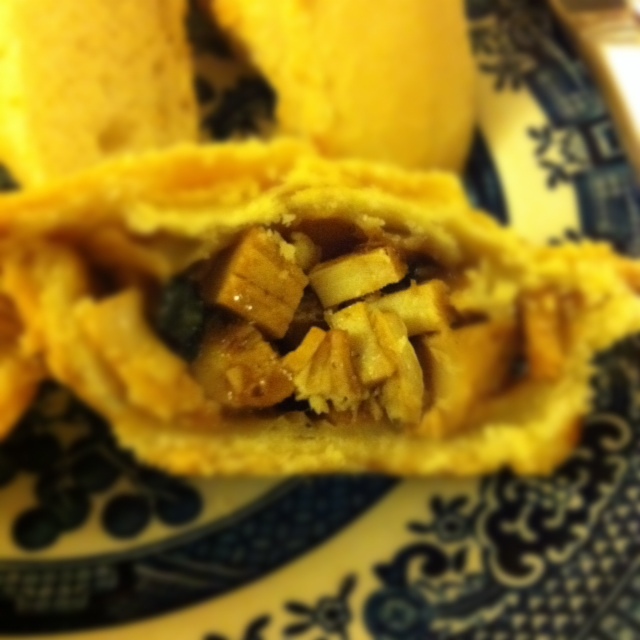 We had some leftover gluten-free pastry, some awesome gravy and turkey – together they make super tasty meat pie!I chopped the turkey small and mixed it with the gravy (enough to moisten and bind it) and then made the pies just like mincemeat one. Baked them at…. errr…. 220°C for about 10 mins and then turned them down to about 190° for 20 mins. Nom! Definitely best hot though. I ate the rest of them on the evening train from Aberdeen – sorry L! Need to keep fingers crossed for our new year’s dinner today though. Disaster struck – we have no electricity to the kitchen until the landlord gets us an electrician (soon please!) so we are running our oven via an extension lead to the hallway. Landlord insists this will be fine, I just hope it works for long enough to roast our pork joint! !